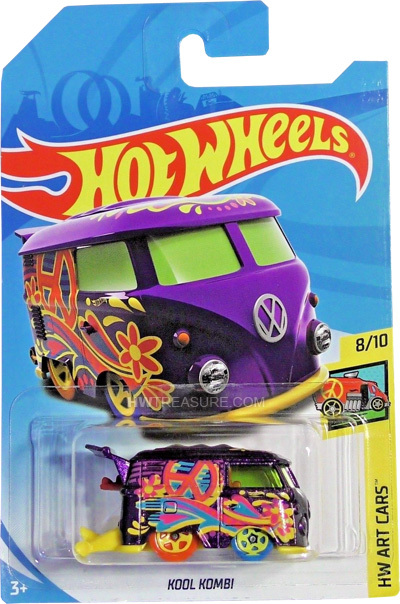 Kool Kombi is a 2018 Treasure Hunt and 8/10 in the HW Art Cars series. The purple van is decorated with yellow, blue, and pink flowers, hearts, peace symbols, and designs. 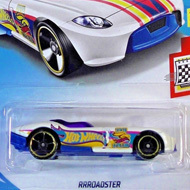 The Hot Wheels logo is on the sides and the low production symbol is on the roof. The van has green windows, a red interior, a yellow plastic Malaysia base, and 5-spoke wheels with yellow rims. The front wheels are blue and the back are orange. 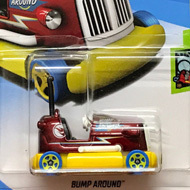 This vehicle can be found in mix “J” of 2018 Hot Wheels mainline cases. The Kool Kombi made its debut in 2013 in the HW Showroom – HW Hot Trucks series. It was previously a Super T-Hunt in 2015.